As with all of my Kontakt instruments, the ethos behind them is not so much an attempt to capture and recreate the past but an opportunity to present the original source material as textures, elements and building blocks in order to create something new. At the same time, hopefully some of the original beauty and character of these rare and vintage instruments and equipment will shine through. A long time in the making, I have been wanting to release for some time now a sequel to one of my most popular Kontakt instruments to date which has been a personal favourite of mine since the beginning. As I’m sure many are aware, I have always had a bit of a soft spot for evocative cinematic synth strings, and especially pseudo realistic string ensembles. It has been very exciting for me that some of these string ensembles and textures have found their way into a number of major music productions around the world. My original String Collection was largely based on early string synths such as the ARP Omni and the Eminent 310U. I wanted to add several new offerings from several other families of synthesizer. The reasoning behind this was an attempt to broaden the sonic territory in what has proven to be a remarkably effective and easy to use layering engine. Some extra elements from my beloved 1938 Novachord #346 have been introduced including a very “warts & all” string timbre straight from the beast. Such elements may sound a little too antique to some in isolation but can form a remarkable secret element when layered with others in the layering engine. It is hard to believe this quarter ton 163 tube monster is 80 years old this year! Around 30 instruments were captured and I’ve tried to draw upon a number of basic synthesis methods including divide down/formant, classic subtractive, DCO, digital FM and additive as well as capturing some tube synth textures from three vintage synths. Synths included the DK Synergy and ultra rare Mulogix Slave-32, Rhodes Chroma, Octave Cat Voyetra-Eight, Farfisa Syntorchestra, ProphetVS, Elka Synthex, Oberheim OB-X and Matrix 1000, Korg PS-3100. Tube synths included the Hammond Novachord, a Jennings Univox J6 and a heavily modified Cordovox CG-1. I have also tried to introduce a number of unique processing methods to add tonal colour, character and movement to various sounds. This included a rather bizarre idea I had to play raw material through a speaker and record it using an old carbon granule GPO telephone mic. This imparted a wonderful crunchy antique character which when layered with the original source produced a rather beautiful effect. Other methods involved recording on and off of rather worn ¼” tape on a wonderful 1969 Revox G36 tube reel to reel. An original 1969 Dolby A-301 (the world’s first Dolby dynamic noise reduction system) and a DBX II 128 compander along with a gorgeous Binson tube Pre-Mixer were also used to good effect. A number of triple ensembles were used to process single string timbres from various synths into something much more akin to the original Solina strings. This included the often overlooked Korg SDD-3300 triple modulated delay and retasking the triple BBD chorus ensemble in the little Böhm Dynamic 12/24 as well as the wonderful “Orbitone” generator in the Eminent 310U. Truly uniquely, I used the latter to process some of the string timbres from the Novachord to produce some very special ensembles! A number of layers and blends were brought together to form the basic 36 instruments loaded into the layering engine to form String Collection II. Novachord #346 is now 80 years old & has proven to be a truly unique sonic ingredient! Approximately 1.2GB of free hard disk space is required. Dan Wilson (Hideaway Studio) Sound Design, Sample Capture, Patches & Demo. Mario Krušelj Synth Engine Script. Anders Hedström (Flavours of Lime) GUI Design & Graphics. Huge thanks to _BT for his enthusiastic support during alpha testing. Posted in News & Announcements, Product Releases, The Hideaway Studio Blog. Its hard to believe its 5 years almost to the day that Hideaway Studio officially opened its doors and its a proud moment. Over the past 5 years I have captured tens of thousands of raw samples from hundreds of hours of recordings resulting in 23 releases for NI Kontakt. Tens of thousands of copies have been sold and I have been blown away by the kind response from so many customers and clients. I have also been extremely excited that my libraries have been immortalised in everything from major film scores and commercial albums to TV scores and computer games around the world. Its also remarkable that over that period I have had over 350 pieces of cherished vintage studio kit in for TLC in The Lab much of which requiring major overhaul and including several major restorations. Several of these amazing beasts have provided the raw sample material for my libraries! Thank you to all of you for your kind support over the years – it is hugely appreciated and helps to keep me going. Posted in News & Announcements, The Hideaway Studio Blog. The Polivoks (Rus. : Поливокс) was designed by Vladimir Kuzmin with input on the aesthetics from his wife Olimpiada who was apparently inspired by Soviet military radios of the time. In production between 1982 and 1990 the Polivoks was manufactured at the Formanta Radio Factory in Kachkanar, Russian SFSR. With a retail price upon release of 920 rubles around 100,000 Polivoks were manufactured – peaking at a production rate of up to 1,000 units a month! Despite this, the Polivoks is not all that commonly seen an instrument outside of Russia. Although intending to appear and sound similar to the Minimoog it has been said that Vladimir never had access to the instrument or indeed any technical information. On examining the schematics, I’d have to agree and go so far as to say the Polivoks is a very different beast indeed on a technical footing. Some have said the instrument was a poor man’s Minimoog but I truly think this is disingenuous to say the least as it sports some interesting unique features such as looping envelopes, a particularly efficiently implemented duophonic note assigner, and a quite remarkable and unique filter design. In fact, whilst producing the original patches for this library I have been particularly taken by the filter on this unique instrument which is like nothing I’ve ever heard before. Sporting both Low Pass and Band Pass modes it can be quite an untamed beast at times but with care also capable of producing some really quite beautiful timbres. It may be full of bizarre old Russian transistors the size of small flying saucers, plastic that feels like it was made from recycled Christmas cracker toys and easily winning the most horrific key-action ever made contest.. I truly adore this wonderful old analog chameleon of an instrument! As always with all of my Kontakt Libraries the raw sample material has been captured faithfully and directly from the instrument (including in this case a few samples taken via a gorgeous 1968 Bruel & Kjaer type 2107 all- tube swept band pass lab filter). The Solo Synth Engine retains the sonic character of the instrument and yet help to present it in a new light permitting a wide range of tonal colours, textures and landscapes to be explored. With this in mind I have included many example patches in the library which I think will help to show the full potential of the Polivox library. Approximately 685MB of free hard disk space is required. Dan Wilson (Hideaway Studio) Sound Design,Sample Capture,Example Patches & Demo. Boris Chuprin Cyrillic GUI Translations. Posted in News & Announcements, Product Releases. Having sifted through and loaded up over 1000 patches during soak testing over 5.5 Hours of raw audio was captured directly from the instrument. Dan Wilson (Hideaway Studio) Rhodes Chroma Restoration & Sound Design, Sample Capture, Example Patches & Demo. Stephen Howell (Hollow Sun, RIP) Original Layering Engine Concept. Mario Krušelj Synth Engine Script,GUI Design & Graphics Anders Hedström (Flavours of Lime) GUI Graphic Design. KontaktHub Customer on the String Collection..
Jacob Golden on The Blue Zone..
“Blue Zone was my very first Hideaway Studios Kontakt library. It’s the one that got me hooked! 🙂 The fact that you’re making these great libraries with all the esoteric sources and signal chains that you use, really takes the pressure off – it means I don’t have to! LOL. Seriously, its a huge thing for me. Chromatix is proving to be a popular new Kontakt library. “I’ve been playing around with Chromatix for some time now and I think this is the best Sample-library I’ve purchased for Kontakt. Being the restless guy I am, I usually make small tweaks to existing patches to suit my needs. But Chromatix have made me make quite a number of sounds of my own. (If you know some of the latest releases from Hideaway you’re also aware that the way you can build sounds with different layers of samples isn’t new, So I’ve had the opportunity to make sounds this way already, in other libraries.) But there’s something about the Rhodes Chroma that appeals to my taste and makes me dive deeper and deeper into a search for new sounds. Thanks Hideaway! “Bought this last week -well into double figures with my Hideaway sound sets now and this is right up there with the best of them! Mark Taylor, KontaktHub Customer on the Zero-1 Synth..
Posted in Reviews & Testimonials. Dear all – firstly may I heartily apologize for the lack of recent postings on the blog. I want to make it very clear that I am still very much committed to my sound design and that a considerable amount of raw sample material for new products is very much in the can awaiting attention. As many of you know, there are two sides to my passion in electronic music both in my sound design and returning cherished vintage studio gear to its former glory. What with there only being so many hours in the day, it is sometimes very difficult to strike a balance between these two obsessions in my life and I often end up feeling like I have let the other side down during times of particularly hard graft. Some of you may already be aware that I have practically lived with two extremely rare early groundbreaking digital synthesizers in my new synth workshop for several weeks now working very hard to return them to their former glory. The two instruments in question represent literally two out of the three known complete existing examples in the world. They are 1979 General Development Systems (aka GDS) originally costing $30,000 and designed in part by members of Bell Labs and MTI/Crumar. The GDS is the instrument that became the direct basis for the wonderful DK Synergy which you have all recently heard in sampled form in Synergenesis. One of the two examples shown here in the recent photo was owned by a very famous pioneering German EM composer and founder of a very influential EM group. It was used extensively in number of well known recordings from the early 80s. This is just the keyboard console – the system comprises of a very large 8-bit computer with twin 8″ floppy drives running CP/M and a large serial terminal. Both systems are now back up and running for the first time in very many years and have been retrofitted with HxC disk emulators which is most definitely a first for this particular model of synthesizer. This has resulted in all of the original software and the factory sound library on 8″ floppy disks being safely immortalized in a modern digital format. It is worth pointing out that such distractions on the hardware front are actually a great thing because all of my time spent working on such technical wonders of yesteryear serve much potential for capturing new sample material and subsequently lead to the basis of new releases. With this in mind the hope was to release such a major release for Christmas based on a significant amount of material captured from a wonderful old beast I restored earlier in the year. This library is still due for release but will now be expected in the New Year. 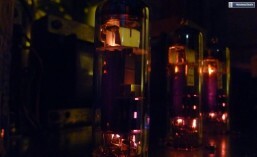 That said, I hope to have at least a little something to allow you all to have the opportunity to play some material captured directly from the KS GDS during testing along with a small offering with a festive edge in the next few days captured from a very rare vintage tube amplified electromechanical instrument. Also lookout for some festive offers on libraries from Hideaway Studio in the near future. May I also take this opportunity to give you all my sincere thank yous for being so supportive over the past year. It has definitely been a year of highs and lows and the tragic loss of Stephen Howell has been extremely painful for myself and Mario and his family. During the summer I channeled a lot of my energy into building a wonderful new synth workshop which really helped to take my mind off of things. 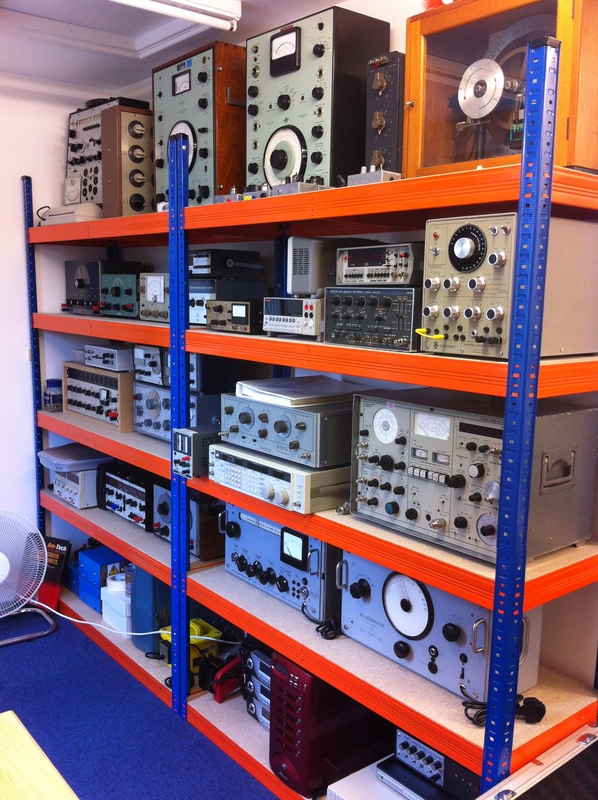 I even managed to finally construct an area dedicated to all of my vintage test gear which has since grown substantially. A large chunk of these vintage wonders were used in the making of The Blue Zone series and are now very much cherished so its great to finally have a dry and warm place to store them for future use. 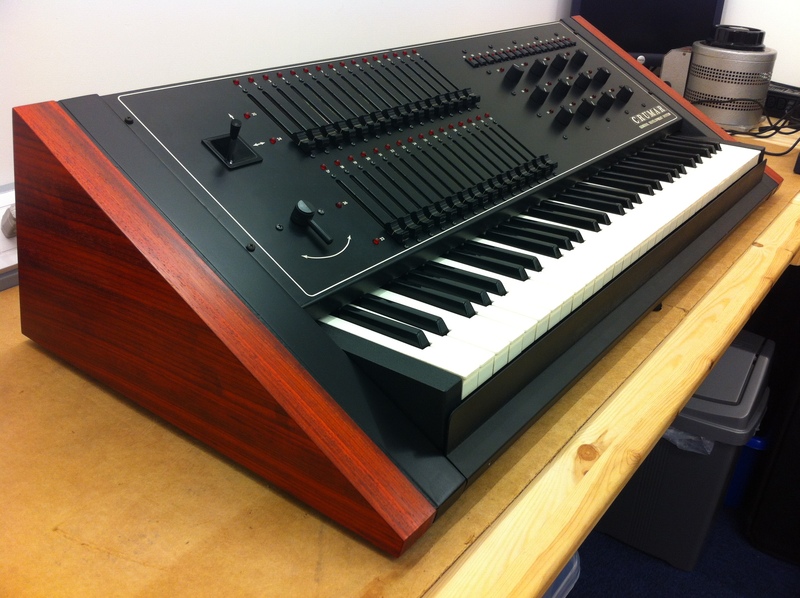 Groundbreaking Pure Digital Synthesis Technology from the 1970s… in 16-bit Audio! The 1970s were to be a magical time when a string of groundbreaking technology was conceived and developed at Bell Labs (BTL), Murray Hill, New Jersey. Many of the developments at Bell Labs have been pivotal and have subsequently played an extremely important part in shaping modern life. This includes the famous UNIX operating system (the grandfather of Linux and all its derivatives), the C Programming Language, fundamental parts of the technology that form the internet, digital telephony, satellite communications and audio/video compression techniques to name but a few. During this time a very talented research scientist called Hal Alles was working on means to implement echo-cancellation in digital telephone systems. This led to the development of an advanced high speed digital oscillator system. On experimenting with the concept it became apparent that it might have some merit as the basis of an advanced music synthesizer using real time digital control techniques. Incredibly, Hal was permitted to setup a side project with funding to explore this notion and after very much toil and expense the Bell Labs Synthesizer or Alles Machine was born. This 300lb behemoth was nicknamed The Blue Monster or Alice for short. At the heart of the Alles Machine was Hal’s high speed digital oscillator technology implementing 64 digital oscillators. The instrument was hosted by a DEC PDP-11 minicomputer (the same range of computers UNIX was developed on at Bell) and literally programmed in C to perform whatever task the operator wished to undertake. Needless to say without any form of dedicated controls, synth engine or patch programming interface very few musicians indeed were able to realise the true potential of Alles Machine! Two musicians that were gifted with the necessary combination of skills to handle The Blue Monster were Laurie Spiegel and Roger Powell. Very sadly almost no recorded material has survived but the few recordings that have reveal a machine capable of generating huge evolving digital soundscapes – this is particularly apparent in Laurie’s Improvisation on a Concerto Generator from 1977. 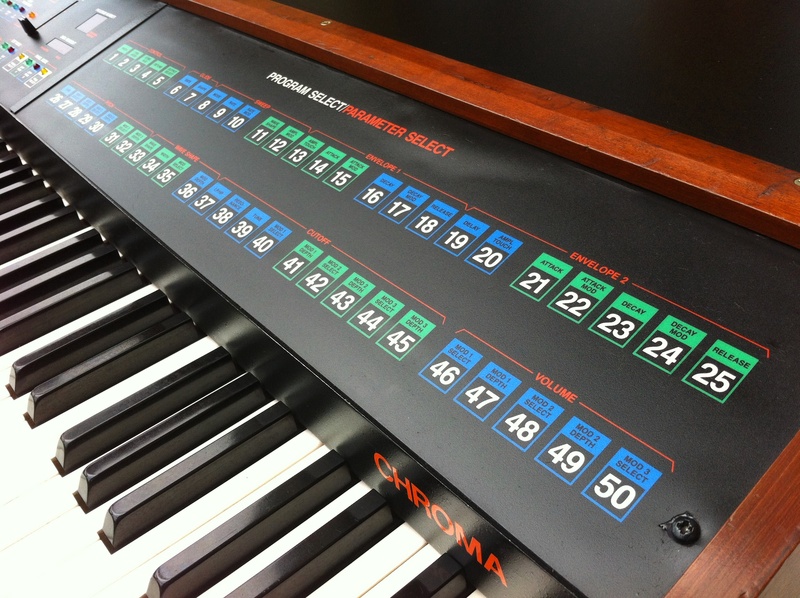 Towards the late 1970s a number of synthesizer manufacturers became aware of the instrument including the MTI division of Crumar who saw the new technology as a means to leap ahead of the pack. A talented development team was assembled and it was agreed that Bell’s Hal Alles and Max Mathews were to offer technical advice on the best means of essentially commercialising the Alles Machine whilst making it much more accessible to every day musicians. The first instrument to be developed was the GDS (General Development System). Although the instrument was hardly inexpensive (it cost around $30,000 in 1979) an ambitious cost down exercise was undertaken to reduce the 1400 or so integrated circuits to only a few hundred. Amazingly, the design team was able to meet the stringent material cost target and the GDS was born. Only 10 or so GDS systems were ever built but it became the sound development tool for its derivatives, the Synergy, Synergy II+ and Mulogix Slave 32. The GDS had a small number of influential owners who were able to work wonders with the new technology. This included Wendy Carlos and Klaus Schulze who released a number of albums and film scores in the very early 1980s heavily drawing on the GDS as a source of digital textures, pseudo realistic timbres and percussion. Following the GDS was the Synergy (DK-1) which relied on the identical 32 high speed oscillator subsystem but coupled to a dedicated Z80 controller thus enabling the instrument to operate stand alone relying on voice cards plugged into the front panel to permit the user to select between or layer up to 4 combinations of 32 patches. A few years later a clever upgrade was offered to basically return the programming ability of the GDS to the Synergy through the use of an external host computer manipulating a special memory area known as VRAM. 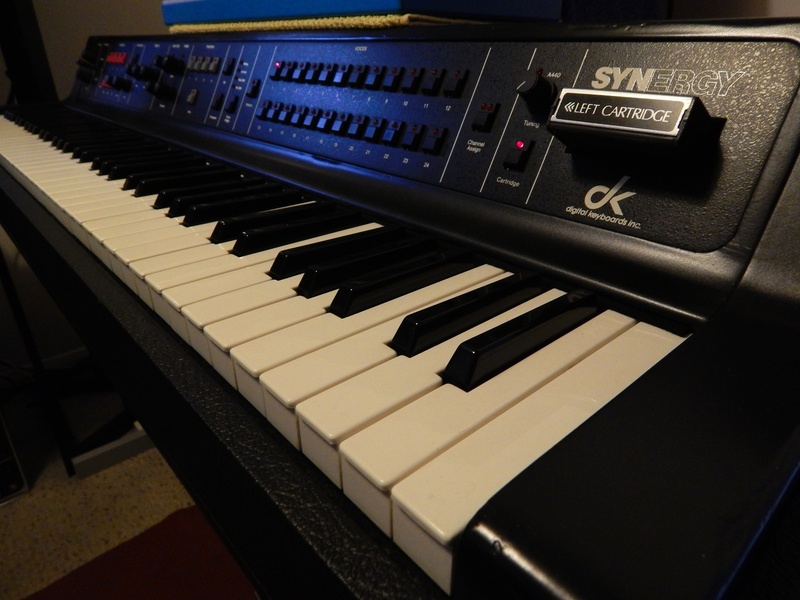 This variant was known as the Synergy II+ but was not sold in great numbers thanks in part to the release of the considerably more affordable DX7. All variants were more than simply large banks of digital sine wave generators as found in more traditional additive synthesizers. They were unusual in that the oscillators could produce both sine and distorted triangular waveforms which could be combined in a very flexible manner ranging from straight additive synthesis, phase modulation or combinations of both. This meant that far more harmonically complex sounds could be generated without having to resort to a massive array of sine oscillators. Not only was the oscillator topology complex but the modulation abilities were truly groundbreaking. Each oscillator had its own envelope and a whole raft of real time modulation could be applied to each control parameter including the notion of switching between low and high velocity parameter sets. Time has not been kind to the Synergy with many examples having perished years ago. Needless to say that very few have experienced a working Synergy let alone a full II+ system first hand in recent times. Quite by chance earlier in the year I stumbled across a now very rare 1983 Synergy II+ in a rather burnt out state with a very interesting past. After a few days of intense research I was able return this poor beast to working order and I set about the soon to be arduous task of finding a suitable Kaypro II computer to be coupled to it to run the infamous synHCS host control application. The task of tracking down a working Kaypro was tricky enough in the UK but the task of running an OS, finding working application software, making a suitable serial cable to connect the two machines, configuring the link and locating the factory patches in the correct format proved to be a major headache. I decided to capture a broad selection some of the more impressive sounds. This turned out to be a bigger task that I had envisaged and after many tens of hours of run time the beast died in front of my eyes and after several hours of mild panic I determined that the very elderly and rather grizzly switch mode power supply had failed. To my great relief the beast was returned to operation the following day having retrofitted a modern high efficiency equivalent in its place (which was half the size of the original!). During my time sampling the Synergy a curious feeling crept over me that I have very rarely experienced whilst sat in front of a vintage instrument – that of sheer wonder that a team of engineers had the vision and bravery to develop an instrument so very ahead of its time and so different from those of the day. In fact, despite the number of wonderful vintage synths I get work on these days, the last time I felt this way was when I was returning the infamous 1938 Novachord #346 to life. The GDS/Synergy II+ is surprisingly capable of synthesizing all manner of percussive sounds including many of a similar but not identical nature to their analog counterparts from drum machines of yesteryear. As well as the main body of instruments Synergenesis features over 220 percussive samples capturing a significant proportion of the drum patches featured in the original factory instrument library which dates back to the early 1980s. They have been presented as two main drum kits and as a series of sets primarily intended to permit the user to preview them and experiment with filtering and dynamics on select sounds. Multiple instruments can then be used in this manner over a number of midi channels if required. 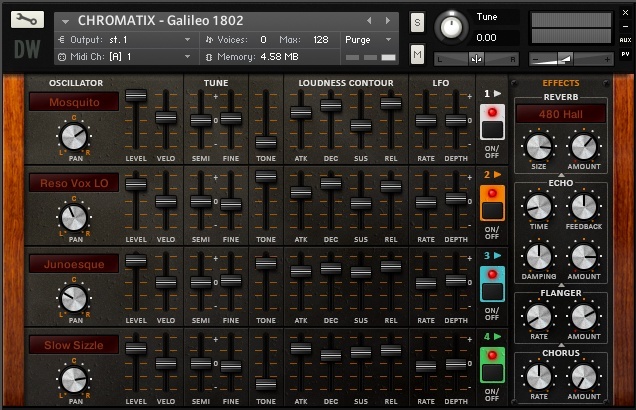 More technically minded users can remap the drum sets as they wish in Kontakt. The drum sounds in this library are also presented in .wav format. As well as the original 24-bit samples the percussion is also presented in 16 and 8-bit formats (all at 44.1KHz sample rate) in their respective folders for use on a wide range of software based sample players and applications as well as a number of hardware samplers such as the MPC series. Approximately 1GB of free hard disk space is required. Posted in Product Releases, The Hideaway Studio Blog.